Just unlike Althouse, the open thread will be mostly empty if not completely empty. This book promises a wide variety of two-hour crafts, but I bet that once you factor into the time allotment how much time it takes you to get the materials together, learn the basic techniques you need to use to make the craft, make the craft, and then clean up, you’re past the two hours. That snark aside, the book draws from a wide variety of craft veins, including needlework, knitting, beading, painting, scrapbooking, and paper arts. It offers a couple of small projects in each and prefaces each section with a list of materials you need and basic techniques you use. Then, each section has a couple of projects using those techniques. However, when it comes down to the actual crafting, you get three steps to everything, no matter how complicated. Because that’s how it’s laid out, you see. Even when step 1 to the build an automobile craft is assemble the engine and drive train. I exaggerate, but not by much. I’ve mentioned that I don’t care for steps in anything that require more than one sentence of imperative mood followed by a couple sentences, maybe, of explanation for why you do it. The book is a pretty good primer on a bunch of crafting things, but I’m not sure I’ll do any of these projects. I might take some things away from it for inspiration, maybe. As a very early starter book to crafting, though, it’s probably worthwhile. Just three months ago, Pinnacle Entertainment and the city of St. Louis were standing side by side to save the President Casino. Now they are racing to the courthouse steps, brandishing lawsuits against each other. City Hall and the Las Vegas-based gambling operator each sued the other Tuesday as a dispute about their contract for Lumière Place casino boiled over. At stake is the city’s shot at Missouri’s precious 13th casino license and $50 million in new housing and retail that Pinnacle had promised to build downtown. The suits focus on a 2004 redevelopment agreement that paved the way for the half-billion dollar Lumière Place. In it, the city agreed to oppose any new casino development within 25 miles — aside from Pinnacle’s new River City Casino in south St. Louis County, which was then on the drawing board. Pinnacle agreed not only to build the glitzy Lumière complex north of Laclede’s Landing but also to put $50 million worth of residential or retail development nearby. Yes, indeed. The corporation got what it wanted and stalls on providing what the city wanted. Maybe they should call this development Casino Village to make the parallels clear. Do you think this latest lesson will teach the city not to take on loans to renovate private property or to cosign loans for mall development where the developer can just walk away or to give great tax breaks and whatnot to developers who want to build something profitable but promise to build something unprofitable and unsupportable afterwards? Hardly. A foolish consistency is the hobgoblin of little minds, such as those who run the city of St. Louis. A quarter-cent Capital Improvement Program sales tax that has been renewed six times in the past is up for renewal again on June 8. But for the first time that anyone can remember, there is organized opposition to the tax that resurfaces streets, builds sidewalks and improves intersections. “People need a break right now,” said Steven Reed, a sales tax opponent who acknowledged recycling “Vote No” yard signs from the recent pension sales tax vote for the upcoming CIP sales tax election. I’ve always seen organized support for pretty much every tax increase I’ve seen on a ballot, often because tax dollars or existing union or other existing organization money is behind it along with the actual organizations themselves. The side of increasing taxes has always had targeted true believers for each cause (people who like libraries acting to support those initiatives, teachers and school boosters acting to support property tax increases, and so on). I attribute the new rise of anti-tax supporters directly to the Tea Party movement because I know that the people who opposed, unsuccessfully, the St. Louis County Metro sales tax on a recent ballot were Tea Partiers. Now we will see some real effort and opposition to tax increases that will stun people who’ve supported the tax increases on autopilot for the last several decades. However, yard signs won’t be enough. To succeed, the opposition needs to master Get Out The Vote efforts. A lot of these taxes are stuck on off ballots in the spring or the summer when turnout is low and favors the true believers out to get the thing passed. I recall voting against a property tax increase for the library in Webster Groves (where I was and still am a dues paying Friend of the Library) on a ten degree February day. The tax increase was the only thing on the ballot, but I carved thirty minutes out of my day to go to the polling place and cast my vote. I didn’t have to wait in line, as only a couple hundred voters out of a population of 23,000 showed up. Mostly to support the proposition. I think the new organization and connections that the Tea Party Movement has made will provide some good energy to drive people to the polls to counteract the continual ratcheting up of tax rates, a half percent here and fifty dollars annually on your assessed value there. I welcome it. Maybe it will compel the government and our elected and unelected municipal leaders to make priorities to spend existing tax revenue accordingly instead of continually going to the bottomless well of citizen pockets. But it will take effort every time. Don’t just remember November. Remember February, April, June, and whenever they sneak the initiatives in. Telling people here that raw crawfish can make you sick won’t work. They’re from Missouri: you’ll have to show them. Pass the raw crawdads, please. The Kansas City Royals are so desperate that they’re holding open tryouts at a city park. There’s something very underdoggish about baseball teams that are often futile. I explained to my wife that the Royals are too often the direct object in the sports headlines (Dodgers Pound Royals, Oakland Shuts Down Royals, and so on), and the direct object teams don’t win pennants. 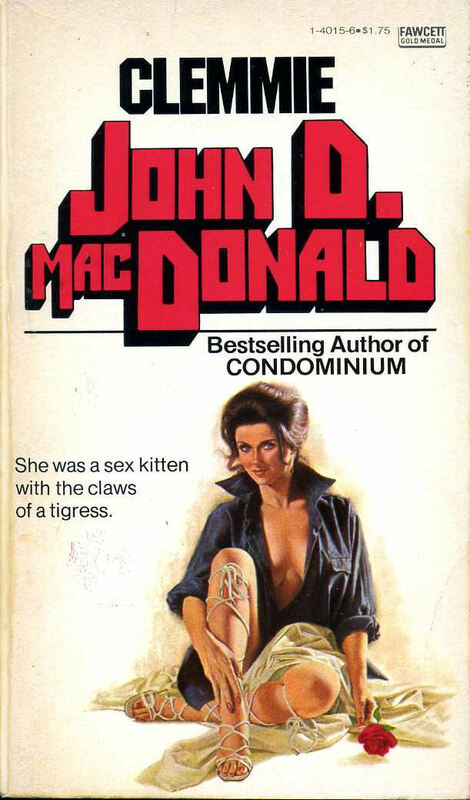 This book represents one of MacDonald’s more bleak novels. In it, a middle manager in Florida is stuck in a rut during the summer when his English wife takes their children to England for a visit. He happens upon a 23-year-old wild rich girl, sort of a Paris Hilton type if you can imagine a Paris Hilton in the Eisenhower years. MacDonald did, so they must have been out there. At any rate, the fellow falls in with this woman, falls into adultery, falls into drunkeness, falls into additional drunken adultery, slacks off on the job and loses it and then ends up with a three week blackout period after which he really has no taste for the rich girl, but when her rich father makes him a job offer to ease the whole kept-man thing, Craig thinks it over, but ultimately decides that he’s going to leave town, with his wife when she returns if she’ll come after what he’s done. The book ends there, although there’s a little hint in a phone conversation he has with his wife over a bad 1958 trans-Atlantic connection that perhaps she will have something to confess when she gets home. The book reminded me somewhat of Kim du Toit’s Vienna Days in that the character starts out sympathetic, and you feel bad for him when he makes a couple bad choices that put him in a tight spot. But eventually they keep making the bad decisions, and I lose patience with them and lose empathy for them. That is not a 23-year-old woman. That, my friends, is someone’s mother who is trying to put a little sizzle back in her love life after an Oprah marathon on Oxygen. Someone that the artist must have wanted to impress. Maybe even sizzle with. City cops are livid over a legislative proposal that could handcuff the brave officers involved in life-and-death confrontations every day — requiring them to shoot gun-wielding suspects in the arm or leg rather than shoot to kill, The Post has learned. The “minimum force” bill, which surfaced in the Assembly last week, seeks to amend the state penal codes’ “justification” clause that allows an officer the right to kill a thug if he feels his life or someone else’s is in imminent danger. The legislators apparently favor bad guys drowning in their own pools. Spend It If You Got It. Or Don’t. This Is Government, After All. Metro commissioners on Friday approved a $232.4 million transit operating budget that reflects the restoration of public transportation service following the passage of Proposition A. Still, the agency’s budget reflects growth over last year’s spending level of $204 million. Friends, that is a whopping 15% increase in a recession. Baer said sales tax collections already were down $5 million because of the recession. Passenger revenue also is down because of a recessionary drop in ridership. Further, Baer said, the state reduced the emergency appropriation it made to restore some service in August 2009. Existing sales tax revenues are down. The existing gap plugged by “emergency” one-time (ha!) stimulus funds is down. The amount collected from riders is down. And Metro increases its budget All the better to cry poverty again in five years when it wants to increase its sales tax, my dear. Responsible government at its normalest. Passenger revenue also is down because of a recessionary drop in ridership. Never again let anyone promote light rail or mass transit by saying that it’s more economical than a car and helps move passengers in a recession. I received an IMPORTANT post card from Laclede Gas in St. Louis. Laclede Gas is the gas utility that powers the water heater and a furnace in my old house in St. Louis (a house THAT COULD BE YOURS!). Apparently, the automated data mining software hooked up to the new smart meters has determined that the vacant house is not using as much gas as an occupied house did. So the gas company sent me a card telling me that I had to schedule an inspection of the meter–to make sure I did not tamper with it, no doubt–within five days. OR ELSE something. As you can imagine, this is an inconvenience to me that I tried to explain on the phone with them. But there are procedures! My glib excuse that no one is showering there is irrelevant! Now, with their first attempt to install the smart meters, they were not too quick to schedule an inspection if they determined I was using more gas than normal as their botched installation pumped extra gas into my basement store room–gas that I was paying for in addition to was threatened with an explosion by. No, the errors that add to their bottom line are assumed to be okay. Were this Facebook, my Doctor of Rhetoric friend would pop up to insinuate that this is a free market problem and that if only the Federal government would nationalize the industry, I would not be threatened with explosion or investigation. However, we in the real world know that’s not true. This little rant is not about corporations being EVIL!. It’s about annoyance with this particular corporate practice. This is the first book I’ve looked at about pyrography, the art of using a soldering iron-like implement to char pictures into wood. So I’ve learned a lot, including the word pyrography. The book inludes a number of projects to get you started and a fair number of templates you can photocopy and trace to make designs on wood. However, the book was first and foremost a good primer on the use of the tool, the different tips, and the different techniques for shading and whatnot. Granted, I probably would have gotten similar instruction from any book about pyrography that I’d bought, but this book will do the trick for you if you’re like I was. Well, if that isn’t the briefest and most useless book report you’ll read all day. But these are craft books, not novels examining the sweeping themes of human existence. What’s important is that you know I read it. I got this book fresh on the heels of reading The Joy of Junk. This book pales in comparison. Apparently, it’s some sort of annual compendium, as it bears the number 8, but I’m not sure what it’s collected from. What it represents is a collection of projects that use things you might throw out to make kitschy little crafts. Frankly, they could have called it Trash to Painted Trash You Can Give For Gifts. Most of the projects end up with a final product that you look at and say, “Oh, that’s a clever use of a .” That is, most of the things don’t transcend their origins. If you make anything out of an old coffee can, for example, you end up with something that looks like a repurposed coffee can. I prefer my projects to transcend the origin of the materials. It’s not my bag. Maybe if you’re into the country style or whatever style relies on cutesy sayings and homespun appearance, you’ll get more than I got from the book. Me, I got one project idea and the recognition that aluminum cans are a good source of serviceable metal to use in crafts. It’s been two years since I’ve updated you longtime readers (and by longtime readers, I mean Charles and that guy from Boeing) on the state of the Noggle Library. 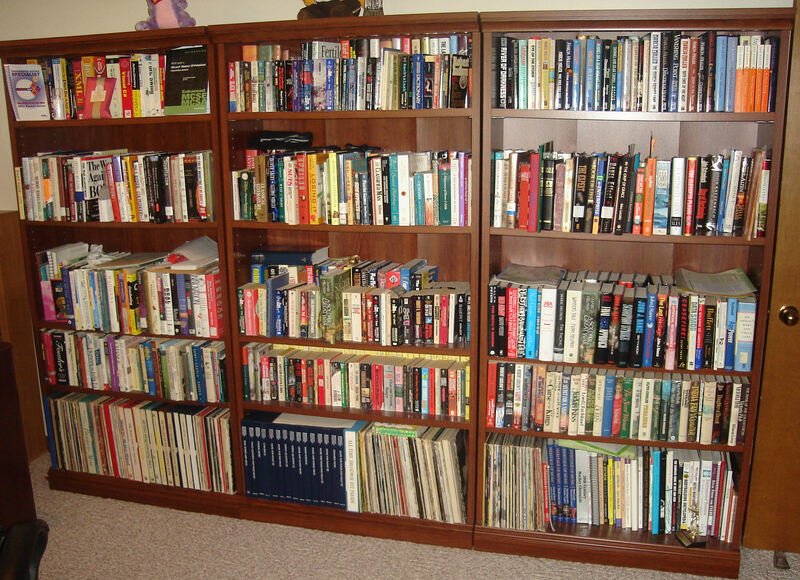 As you might have gleaned, we have once again had to buy a bigger house to accommodate the library, so things have been rearranged somewhat. This new house represents a departure from previous homes in that some of my reference books and some of Heather’s books are starting to cohabitate on the same shelves. Not the main libraries, but some of the fringe material. That being said, here are the pictures. 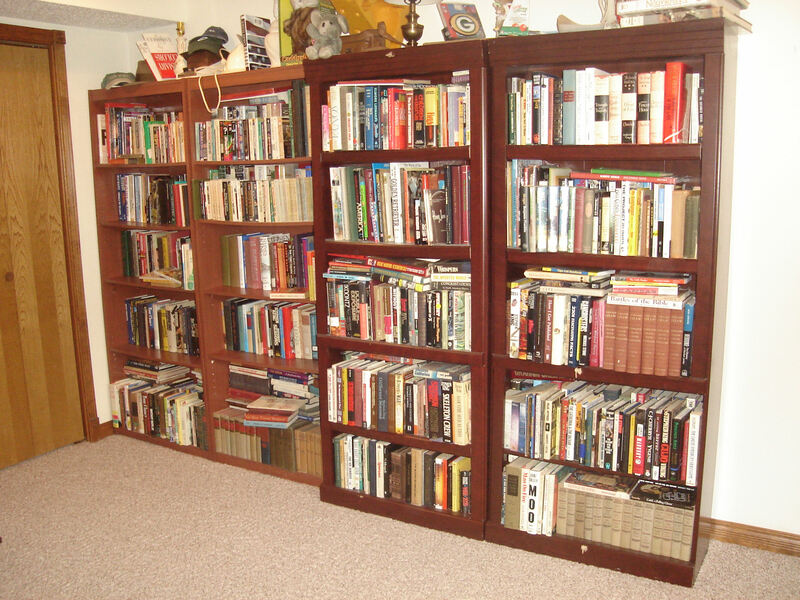 I also have two bookshelves of paperbacks that I have read in my office. If you look closely, you’ll see some Executioner titles that you’ve read about recently. 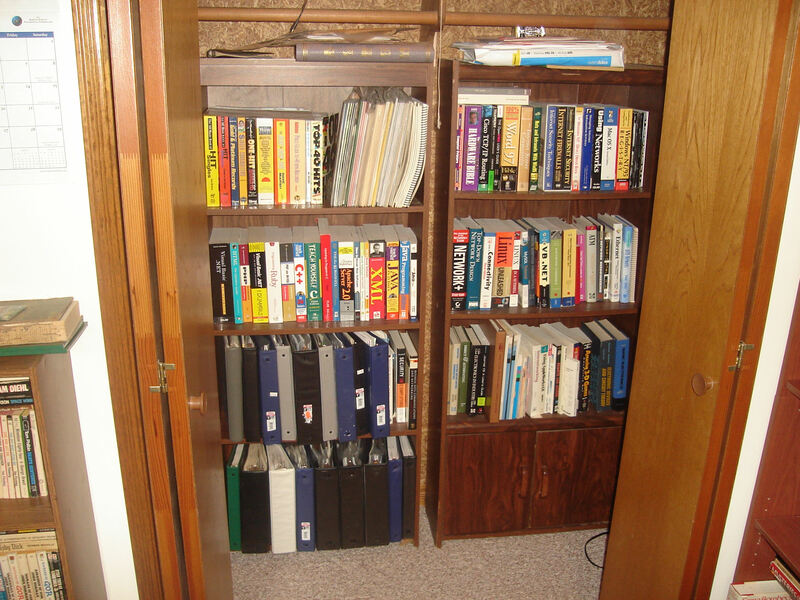 What, are there even bookshelves in Brian’s office closet? Of course there are. 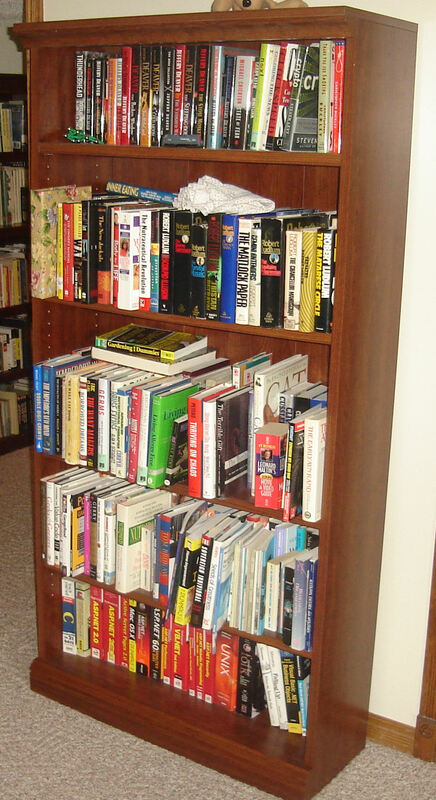 On the back wall of the main lower level room, we have the two commingled shelves I spoke of. 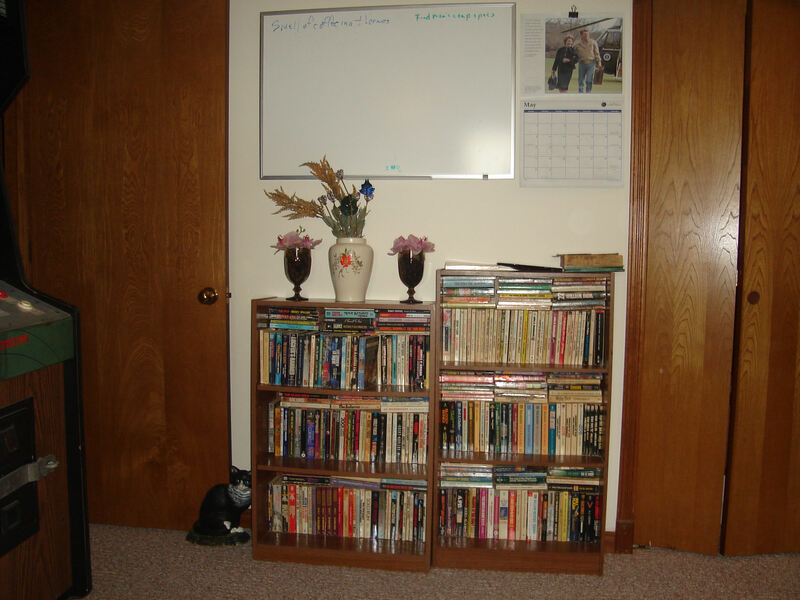 These shelves include crafting books, children’s books, Heather’s collection of Sue Grafton, some music books, and some religion books. Heather’s office sports these bookshelves, new Sauder bookshelves which seem to be simultaneously weaker and heavier than the previous models. They’re wider, though. 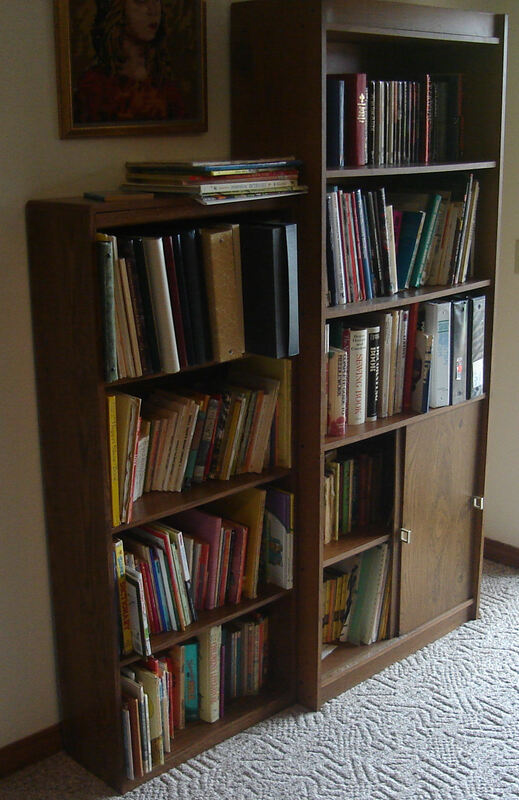 Heather has this bookshelf in her office, too. 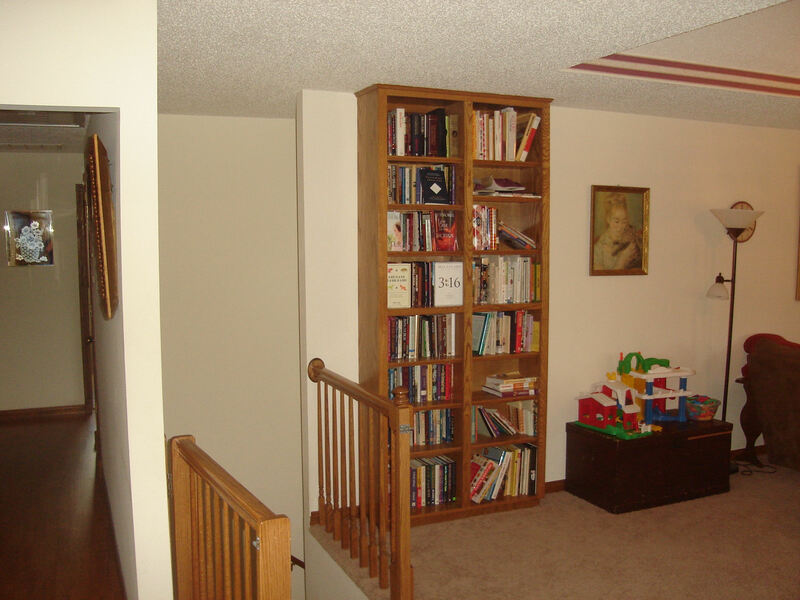 Through the door, you can see the bookshelves in the hall. 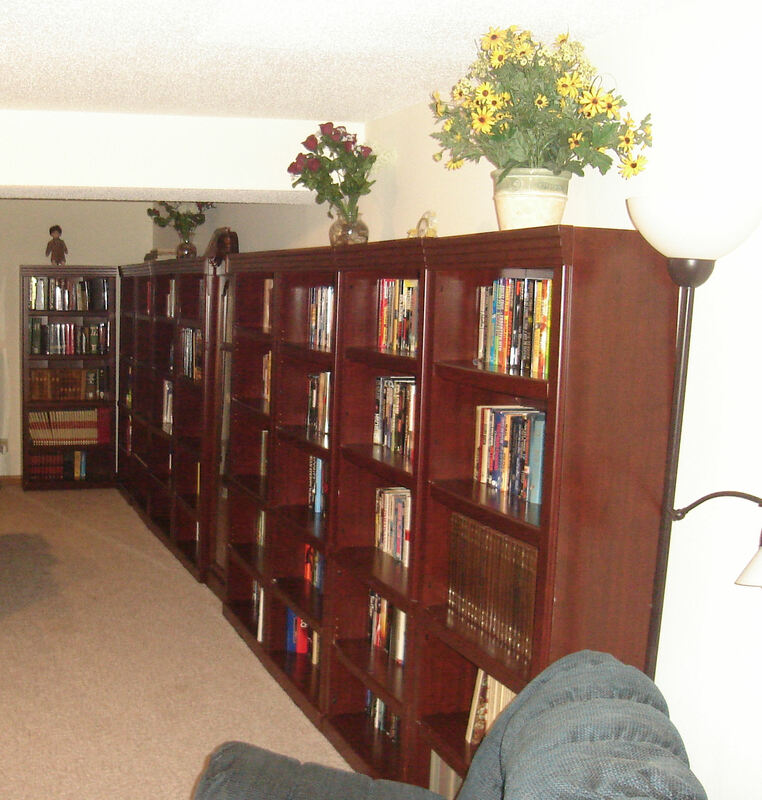 The living room sports some built-in bookshelves with Heather’s religious books and cookbooks and our current library books. We go to the library when we don’t have anything to read. 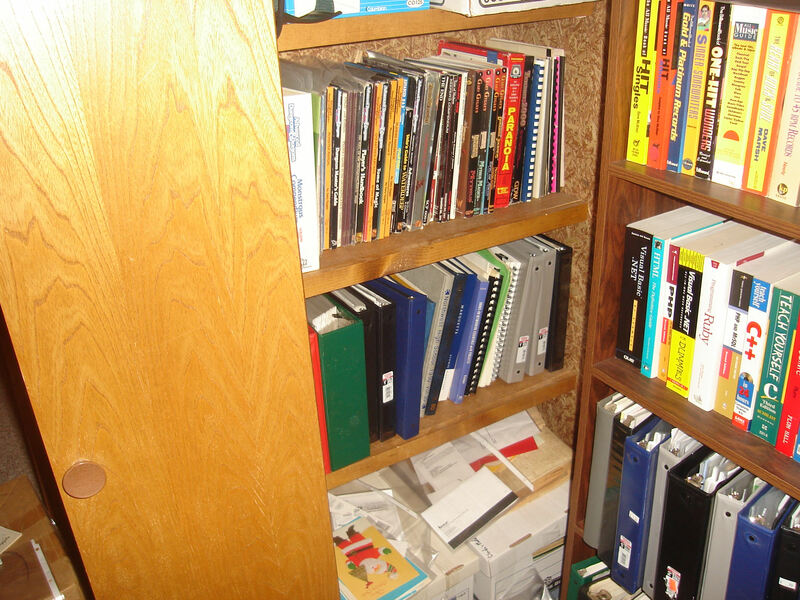 The youngest child has a bookshelf in his room. 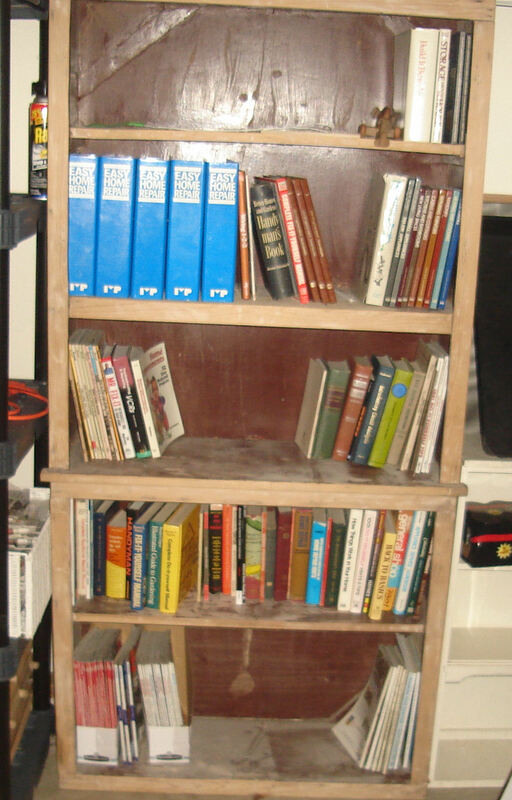 And in the garage, we have our woodworking/home repair/gardening books. So that’s the bulk of it. This year, I didn’t depict the hymnals on the back of the piano, the stack of books on the mantle/table beside my reading chair/headboard of the bed. 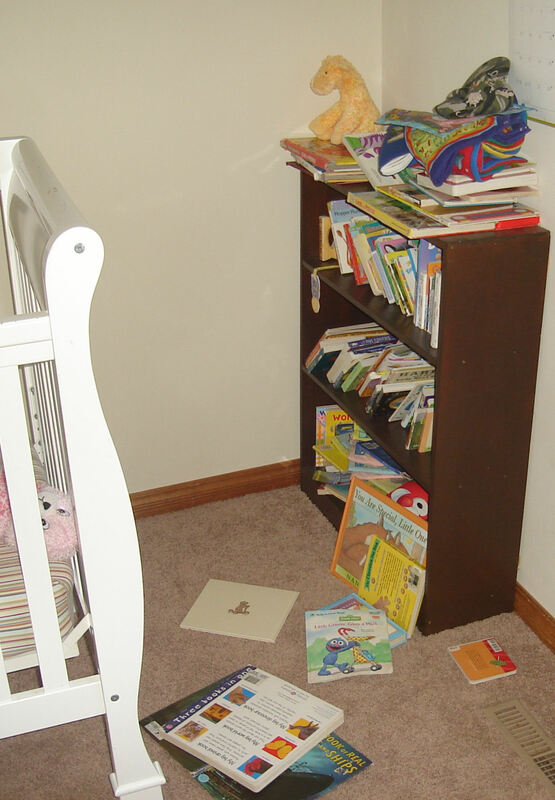 Also, the two bookshelves from the older child’s room are in temporary remission since he’s in a big boy bed, and he would read the books on the bookshelves rather than sleep. So we’re beyond the level of normal readers/book owners and have turned the corner toward professors. 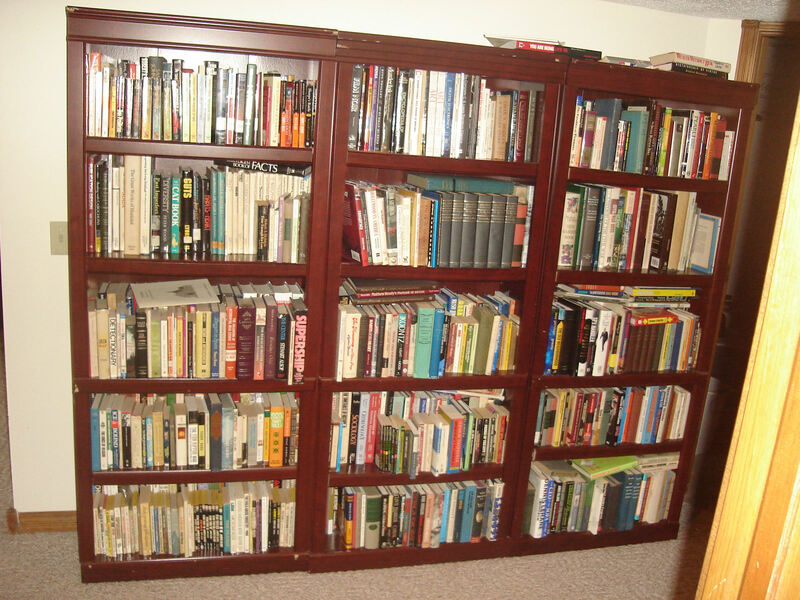 Additionally, given the short lifespans of my people and the thousands of books on those to-read shelves, I probably actually own more books than I can read in my lifetime unless science gets busy stretching that for me. Compare and contrast this to your own library, and feel free to call me a wanker like Kim du Toit did when I first posted pictures of the library in 2003. I just bought a new washing machine, and as part of the list of monies they remove from the price of the machine was a recycling rebate. Hey, cool, I thought, $75 dollars. That’s almost as much as the extended rebate they offer, which I took since my last washing machine failed in multiple ways within the five year window of the rebate. As a small government conservative, my first inclination is to tear the rebate form up and write a blog post about it. On second thought, though, I think I’ll stick it to The Man and take the money and donate it to Ed Martin, candidate for House of Representatives in my old district (MO-3) so he can defeat Russ Carnahan, and Roy Blunt, candidate for Senate so he can defeat Robin Carnahan (yes, the Democrats are brother and sister and the children of former Missouri governor Mel Carnahan who was elected to the US Senate while dead and whose wife and mother of the aforementioned Democratic candidates served in Mel’s place). The fact that my stimulus money might increase incumbent unemployment by one (Robin will keep her day job ghostwriting ballot initiatives) will give me a warm feeling inside. The requisite paean to rail travel, “Waiting on a Train”, which goes on again about how awesome rail travel is and how it’s coming back for passenger transportation again. Overlooking, as these things do, how slow it is relative to air travel and how inflexible it is relative to automobile or bus travel. But what’s important is that central planners will decide where it goes and when it goes. “We had a clean slate, so why not do things right?” says former City Council President John Janssen. City officials envisioned a model for other communities. So you get the normal central bureau building it all green and following the latest dictational fads instead of letting the citizens build the city according to how they would use it. You know, the old fashioned way, before city councils got addicted to playing SimCity with their personal ambulatory Sims. Oh, I’m inspired, all right. Inspired to hit SurvivalBlog for more tips on what to do when society collapses under the weight of these prigs’ self-absorbed, self-righteous busybodiness. The soybeans, however, remain a question mark. Stuff I planted over a week ago has yet to emerge. I’ve had soybeans take as long as 3 weeks to emerge, but I don’t like it. It makes me nervous as all git out. Every spring that I do planting, I get very concerned that I’ve killed the live plants I put in or that I’ve put seeds in too deep. 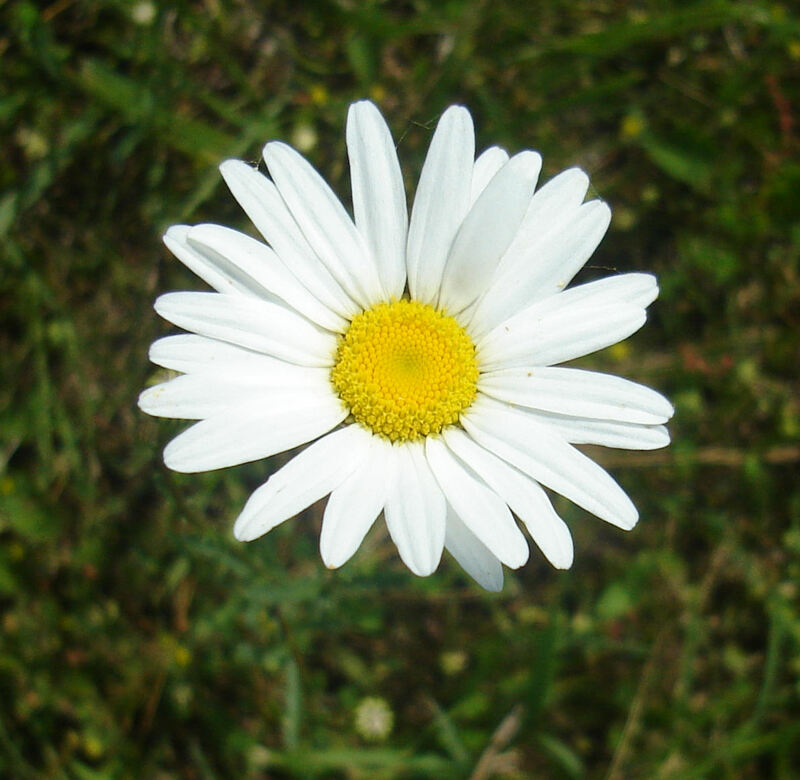 Then, when they emerge or bloom, I receive a very pleasant surprise. Of course, I don’t do it for a living, but I bet his senses are akin to when I get a new client, do the work, and send an invoice and have to wait sometimes 30 or 60 days for a check to come. When it does, whoa! It worked! Every time. This book follows Arizona Ambush in the series, so I get to feel like somewhat of an insider when Bolan refers to the events in Arizona and I know what he’s talking about. Unfortunately, this book ropes in a large number of other characters from preceding novels, characters who now work with the government in a special group targeting the Mafia. So the reader who comes to the series late (me) is left outside a little, and the book spends whole chapters filling in expository backstory rather than shooting-em-up. So the book is not the strongest entry in the series. I understand from Wikipedia that Bolan eventually works with this group, so the whole “what is the agenda not only of the Mafia, but also of the bureaucrats and lawmakers on the good guys’ side?” intrigue will probably grow, too. That said, the plot of the book gets a little short shrift. Bolan goes to Memphis and Nashville and works with SOG (the special operations group) to rescue a couple of members in an attempt to infiltrate the drug-running arm of the mob. In doing so, he meets a country-and-western song maveness married into and under the thumb of the local boss and uncovers a plot to blackmail powerful politicians. Overall, a weaker entry in the series. I really ought to try to get some of the earlier work. Definitely in the middle of the three I’ve read recently. I picked this chapbook up on the Local Interest shelf in Borders here in Springfield, hoping to find a collection of poems about the Ozarks. However, Hoogestraat is not of the Ozarks, she merely teaches college English in the Ozarks, no doubt to her disappointment. The collection of poems, then, is a standard slot of the Important Lessons modern poetin’ professors want to lay on their students. In a turn of good luck on her part, she wound up in Springfield, so she got to write a poem about a lynching 104 years ago that has Great Implications Today about the inherent oppressiveness of Springfield residents even today. A toothless bearded man makes an appearance in another poem. Not my bag, really. Nothing in it that touched me or made much of an impression on me. I’m kinda sorry I bought the book and am really sorry I paid full price for it. Back in the olden days, chapbooks were only $3. You know, cheap books. Good Lord, He’s Still Around? Ravenwood is still running Ravenwood’s Universe? He’s still got my wife’s picture rotating in his FemmeBlogger’s section, which brings back some awefully nice memories of that black dress. I’ve added him back to my new blogroll as a daily read. Check him out.